Monumenta is series of monumental exhibitions at the Grand Palais, one of the great historic buildings of Paris created for the 1900 World Fair in the heart of the French capital. After Anselm Kiefer (in 2007) and Richard Serra (in 2008), French artist Christian Boltanski was invited by the Ministry of Culture and Communication to create an exceptional new work for the 13,500 square meter exhibition space. 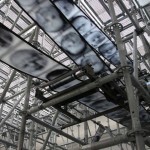 The work Boltanski has created for Monumenta is titled “Personnes”, on view at the Grand Palais until February 21, 2010. In this conversation with Christophe Ecoffet, Christian Boltanski talks about the concept of the exhibition: what he wanted to achieve with this work, the title of the exhibition, the challenge of producing a work for the Grand Palais, the sound of heartbeats the visitors hear while walking through the exhibition. Christian Boltanski, born in France in 1944, is one of the most internationally acclaimed artists of our time. In 2006 he was awarded the Praemium Imperiale. His artistic work revolves around the themes memory, death and loss. For Monumenta, Christian Boltanski created a work in sound and vision titled “Personnes” – meaning both “people” and “nobodies”. Personnes is a “social, religious and humanistic exploration of life, memory and the irreductible individuality of each and every human existence – together with the presence of death, the dehumanisation of the body, chance and destiny. Conceived as a work in sound and vision, Personnes takes up a new theme in Boltanski’s work, building on his earlier explorations of the limits of human existence and the vital dimension of memory : the question of fate, and the ineluctability of death. Personnes transforms the entire Nave of the Grand Palais through the creation of a coherent, intensely moving installation conceived as a gigantic animated tableau. Personnes is a one-off, ephemeral work. In accordance with the artist’s wishes, the components of the piece will all be recycled at the end of the exhibition.” (Excerpt from the press release). Christian Boltanski: Personnes / Monumenta 2010 at Grand Palais Paris / Interview. Video: Christophe Ecoffet. 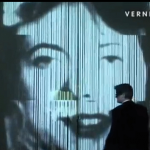 PS: See also VernissageTV’s coverage of Christian Boltanski’s retrospective at Kunstmuseum Liechtenstein: Christian Boltanski. La vie possible / Kunstmuseum Liechtenstein.